The Amazon Editors’ Pick for the Best Book of 2017: In the 1920s, the Osage found themselves in a unique position among Native Americans tribes. As other tribal lands were parceled out in an effort by the government to encourage dissolution and assimilation of both lands and culture, the Osage negotiated to maintain the mineral rights for their corner of Oklahoma, creating a kind of “underground reservation.” It proved a savvy move; soon countless oil rigs punctured the dusty landscape, making the Osage very rich. And that’s when they started dying. 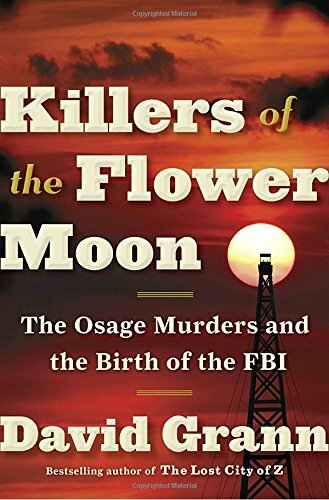 You’d think the Osage Indian Reservation murders would have been a bigger story, one as familiar as the Lindbergh kidnapping or Bonnie and Clyde. It has everything, but at scale: Execution-style shootings, poisonings, and exploding houses drove the body count to over two dozen, while private eyes and undercover operatives scoured the territory for clues. Even as legendary and infamous oil barons vied for the most lucrative leases, J. Edgar Hoover’s investigation – which he would leverage to enhance both the prestige and power of his fledgling FBI – began to overtake even the town’s most respected leaders.